Italian niche line Bois 1920 has launched Oro 1920, part of their Limited Art Collection (see Dolce di Giorno, Sensual Tuberose, Relativamente Rosso and Vento nel Vento). A perfume full of depth and energy with a mystical allure. Oro is an exemplary creation, combining Florentine values and the Galardi family’s rich tradition of perfection and use of natural raw materials as a statement of respect for the ancient perfumer’s art. In the skilled hands of master craftsmen the extrait de parfum is further enhanced through the realization of a precious flacon decorated with 24 carat gold and an elegant hand-made leather case from Bottega Veneta. The notes feature ginger, incense, aromatic pine, raspberry, guaiac wood, iris, May rose, osmanthus, opoponax, tobacco, vanilla and leather. 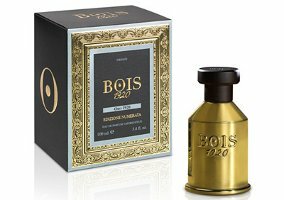 Bois 1920 Oro 1920 is available now at MiN New York, $820 for 100 ml. Sounds lovely. But for that price it would have to prepare me a gourmet dinner, take care of my children, do my taxes, and drive me around for a week. All of these releases that make you pay at least $100 (this case is more like $600) extra for the packaging have really ugly bottles. My favorite bottles are the Profumum, rectangular Agonist bottles, and Nanadebary bottles. I don’t think that bottle is ugly. Wouldn’t pay $800 for any perfume though.